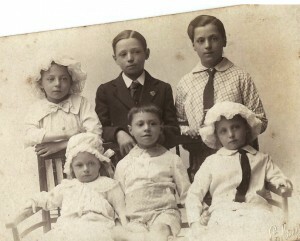 Giulianotti, another Italian family, is connected to us via the Brattisani sisters. The roots of the Giulianotti and Brattisani/Brattesani families are from little hamlets scattered in the valleys of Parma in Italy. Their backgrounds would be similar and probably they would have been connected via marriages back home in Italy. 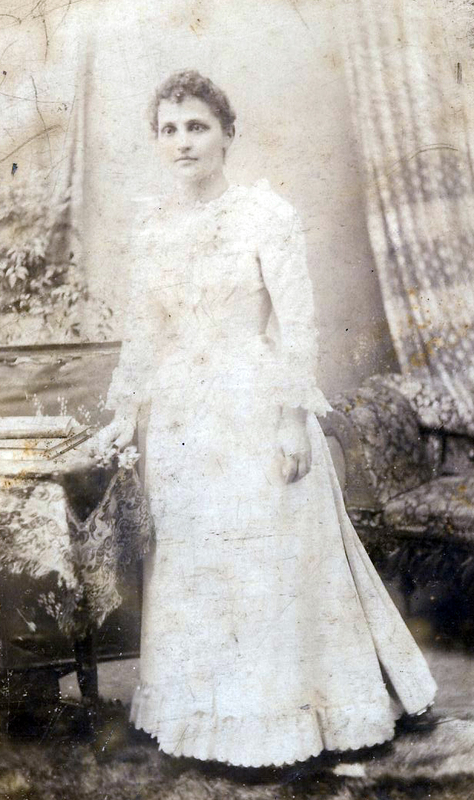 Rose married Giulio Giulianotti in Edinburgh in St. Mary’s Cathedral on 18th October 1892. Their witnesses were another sister, Maria Brattisani and John Fusco, her betrothed, who were also to be married a few years later. The Giulianotti family settled in the northern areas of Scotland, firstly in Aberdeen, Dundee and Inverness.http://en.wikipedia.org/wiki/Aberdeen. The story goes about Giulio that he entered Scotland via Peterhead on a boat from Italy. Because of the circumstances of his arrival here he was sent to jail for a short period of time. But on his release he met up with the various lines of his family in Scotland who had settled in the big cities. The Giulianotti family originated from Borgo Val di Tora, the same valley as the Brattesani clan. The families would almost have certainly knew each other’s families back home in Italy. Giulio Giulianotti at the time of their marriage ran a restaurant at 38 Bread Street, Aberdeen. His parents were Giuseppe Giulianotti and Rose Zanre. History does not tell us how this couple met up again in Scotland but we do know that in 1892 at the time of her wedding Rose lived with Valentina, her elder sister and her now husband Emilio Quilietti at 4 Cranston Street, just off the Royal Mile, Edinburgh. 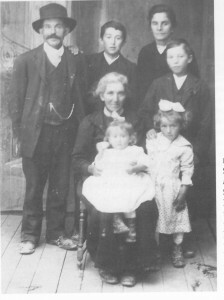 After the wedding Rose left Edinburgh and moved further north and their first son was born in Dundee on 29th November 1894. His name was Giuseppe Giulianotti. His children in turn carried on the family businesses as confectioners and ice cream manufacturers and became well established in these northern Scottish cities. Rose and her Giulio were to keep in close contact with the Quilietti family in Edinburgh and we know that Giulio was at the deathbed of Emilio Quilietti in the year 1899. With the tragic death of Emilio and of Valentina 5 years later family ties were cut and the children of both Valentina and Rose were to become strangers, an unfortunate event that would never be re-established, until now. Angela Giulianotti and Helen Quilietti have now re-united our families. Thank you Angela. GIUSEPPE [Joe] was born on 29th November 1894. 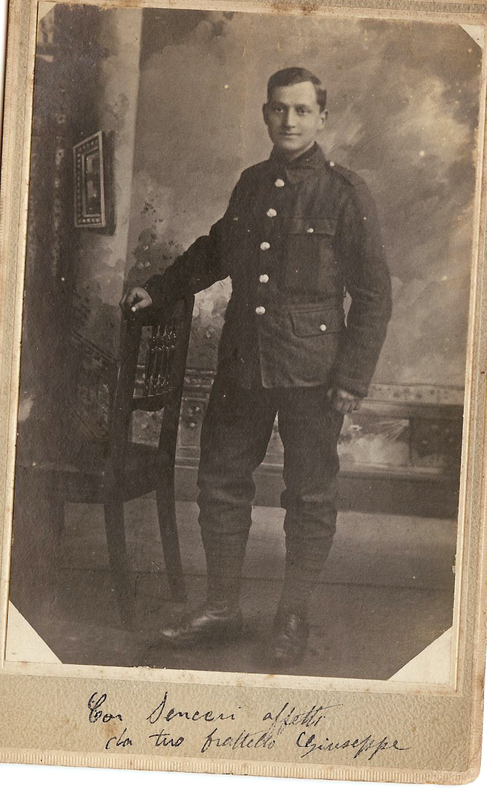 He married Susan Anderson Lamb on 5th April 1918 at St. Margaret’s in Loanhead, At this time Joe was in the army and served as a Private No. 30560 in the 3rd Batallion of the Royal Scots. 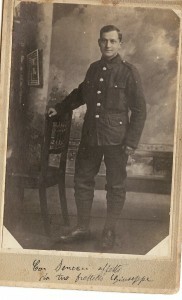 He was serving in Mulligan in Ireland at the time of their wedding. Susan who was born in 1899 lived in Roslin. Her father was a coalminer. Joe died on 30th September 1968 in Woodend Hospital in Aberdeen. He was 74 years old and the longest living of Rosa’s children. VITORIO GIOVACCHINO BARTOLOLEMO GIULIANOTTI was born on 9th August 1901 at 2 Castle Terrace, Aberdeen. Victor as he became known never married. He died on 19th October 1948 in Aberdeen Royal Infirmary of a celebrial Haemorrhage. 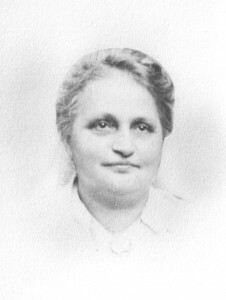 VALENTINA LUCIA GIULIANOTTI was born in 1905 and named after Valentina Brattisani Quilietti and Valentina’s mother Lucia Coffrini who had both died earlier in this same year. The baby Valentina died aged only 3 months. ALFONSO FREDERICO GIULIANOTTI was born on 15th March 1907 at 5 Justice Street in Aberdeen. He died in 1910. ANTONIO GIULIANOTTI is the father of Angela who is helping me with this webpage. Antonio was born on 12th November 1915. After the death of his parents Antonio joined the army. He left Scotland and headed for London where he married and brought up his family. They lived in the Colinsdale area of London. He died when he was 54 years old London, England. and Rosa Brattisani worked hard and made Aberdeen their new Borgotora. We know now that they made a good living in confectionery, ice cream and fish and chips. Rose had maids who helped her with the children. Their wealth allowed them to return home and this they did on many occasions to escape the harsh winters that Aberdeen presented. Rose kept in very close contact with her surviving sisters and she has left us a wealth of history in the photographs which were handed down to her grandaughter Angela. Amongst these photos were Brattisani, Fusco, Costella and Quilietti photos. History in the making. Home to the Giulianotti clan was the village of Borgatoro, just outside Varna in Northern Italy. Many of the Giulianotti family married into the Zanre family and we have brothers and sisters of both intertwining. The Brattisani family also hailed from this same town. Some of the pioneers we find in Scotland are listed below. They of course had many descendents who are still living here in Scotland as fifth and sixth generation Italians. Their son Emilio Giulianotti was born in 1901 but died 2 days later. Their daughter Rosa Zanre married Bartolemeo Giulianotti, her cousin. They settled in Blairgowrie. Rosa died in 1949 aged 70 years. ANTONIA GIULIANOTTI married ELIZABETH LANDINI on February 8th 1898 in Borgotora, Italy. 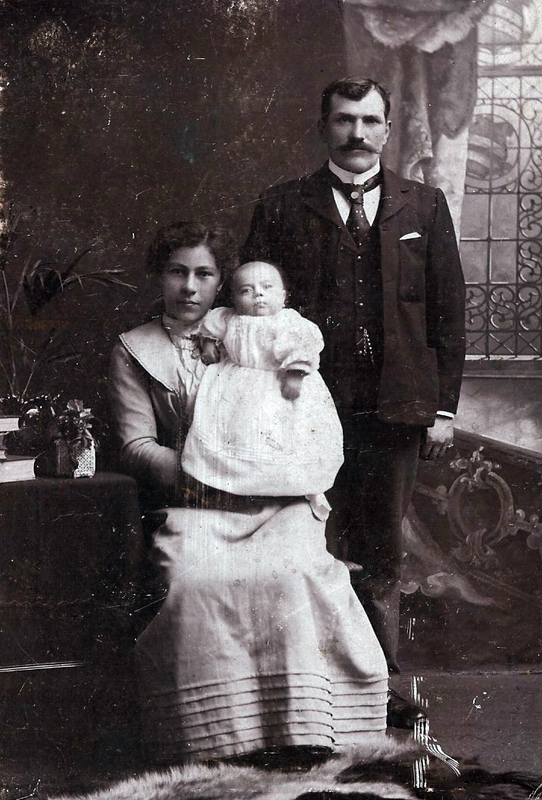 Antonio was born in the year 1869 in Borgotoro, Italy and died on 11th June 1947 at 24 Chapel Street, Peterhead. His paraents were LUIGI GIULIANOTTI and DOMENICA GAPARINI. The Scottish Census of 1901 finds the family living at 22 Chapel Street, in Peterhead and gives their occupation as Ice Cream Merchants. October 1900 ata 20 Chapel Street, Peterhead. 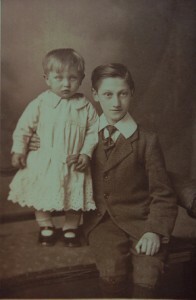 Their son Adam Peter Giulianotti was born on September 18th 1899 in Peterhead. Adam married Maggie Jane Keith and had at least one son Albert Giulianotti. Their daughter Adellina Domenica Luigia Giulianotti was born inPeterhead. Guido became a Company Director and married a girl by the name of Jenny Bruce. He died in 1965 in Aberdeen age 63. Their daughter Maria Domenica Giulianotti was born on September 10th 1905 at 22 Chapel Street, Peterhead. Their son Attilio FiglioGiulianotti was born on 3rd November 1907. He also became a Company Director. He in turn married another Italian by the name of Vittorio Luigia Maria Bellini. He only died in 1990 in Aberdeen. 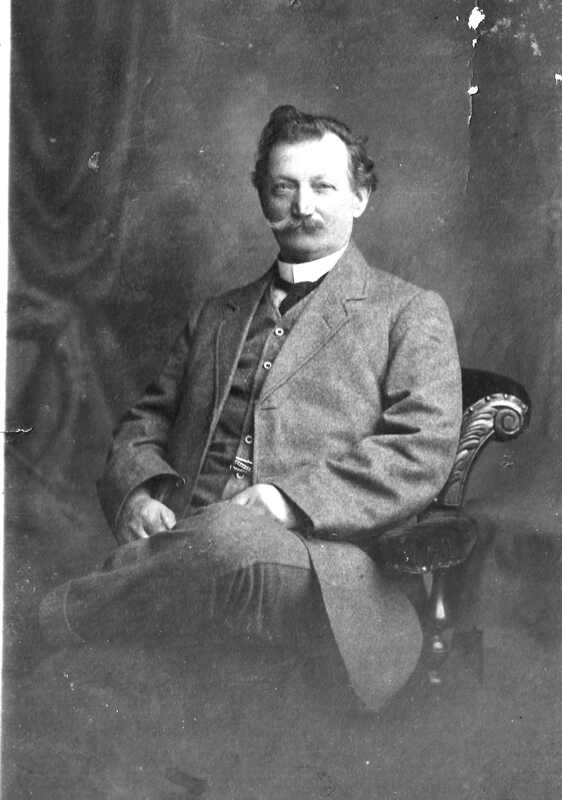 Their son Giuseppi Giulianotti was born in 1883. 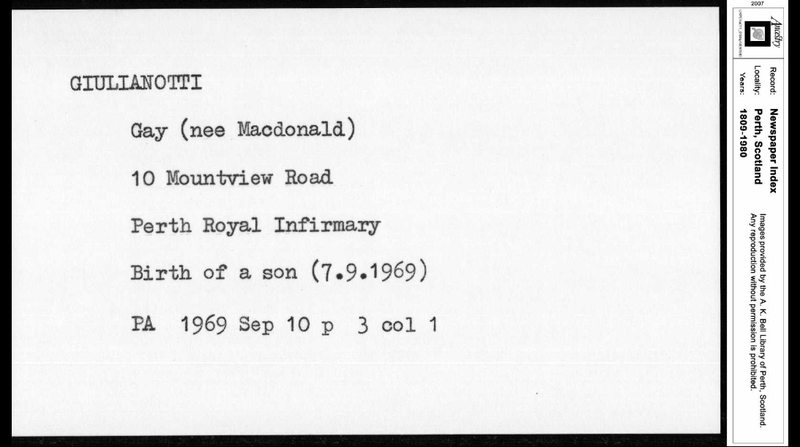 He came to Edinburh but died at a tender age of 23 years in Edinburgh Royal Infirmary. Their son Severino Giulseppe Giulianotti was born in 1880 and married Assunto Corvi in Perth, Scotland on 6th July 1908. 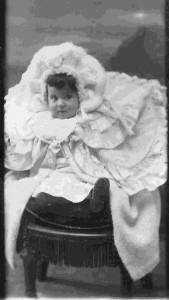 Their daughter Ermerlinda Giulianotti was born in 1861 and died in Perth on December 13th 1910. Their son Bartolomeo Giulianotti was born in 1864 and he married Rosa Zanrae. They lived in Blairgowrie, Scotland. GIOVANNI GIULIANOTTI married ANGELINA ZACCARINI on November 25th 1899 in Borgotora, Italy. They also came to Scotland and lived at Torry Rigg, Aberdeen, in Scotland. Angelina died at a tender age of 29 years. Their daughter Disolina rosa Giulianotti was born 1902. She married Goerge Frances Allan Smith in 1922 in Aberdeen. ANTONIO GIULIANOTTI married MARIA COFFRINI on February 8th 1899 in Italy. EMILIO GIULIANOTTI, married ANGELA DOMENICA MARIONI. Emilio was also a confectioner at the time of their marriage. The family settled at 7 Chapel Street, Aberdeen. Their daughter MARIA DELVIA GIULIANOTTI and she, like her forefathers also married another Italian Emilio Bicocchi, whose profession was also a confectioner. Their son EMILIO LUIGI GIULIANOTTI was born in 1911 and married a Scottish girl by the name of Edith Helen Dallas Hay. This family settled in Peterhead. Their daughter DOMENICA GIULIA GIULIANOTTI was born on 20th May 1906 inFraserburgh. Their son ROBERT GIULIANOTTI also settled in Fraserburgh. 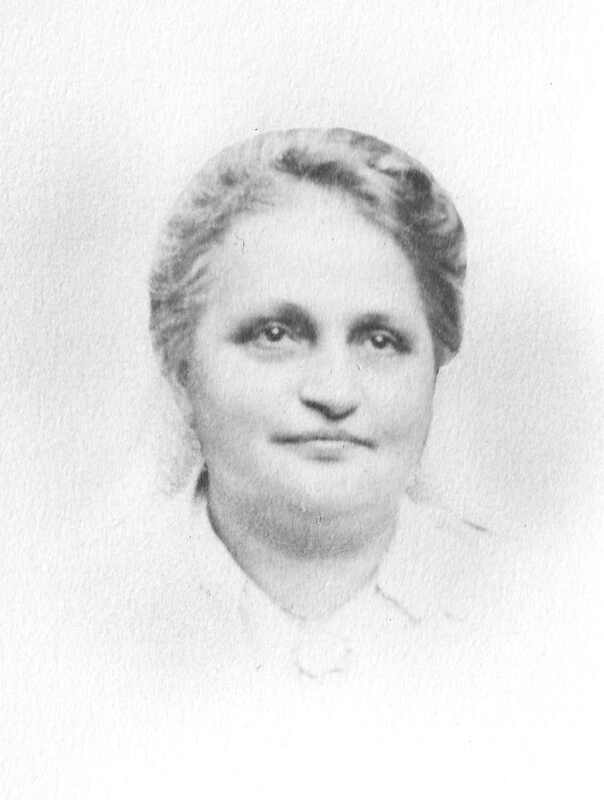 Their son Nicodemo maried Matilda Becci in Borgatoro on 6th February 1902. We have recently had correspondence from Lynda Giulianotti, granddaughter of Nicodemo. My Name is Lynda Anderson, my maiden name was Giulianotti, my father was Alessandro Giovanni Giulianotti (Johnny) my mother was Annie Pratt (Nan) , I have two siblings ,Charles ,and Stella, another died in infancy ( little Johnny). ALLESSANDRO GIOVANI GIULIANOTTI was born on 17th May 1902 at 15 St. Andrew Street, in Aberdeen, Scotland. He married Annie Pratt. Three children, Lynda, Charles and Stella. ROBERT GILDO VITTORIO GIULIANOTTI was born in Aberdeen on 23rd November 1903. LYNDA GIULIANOTTI – Lynda married into the Fuggachi Clan and settled in London. Children Armando, Rena and John. Their son GIUSEPPE CESARE GIULIANOTTI was born in 1905 and died in 1968 in Market Street, Aberdeen. GIULIANOTTI — PETER. Peacefully, at 8th August, 2008, Peter, beloved husband of Linda, a much loved dad of Michael, father-in-law of Marilyn, a devoted granda of Michael and Raymond and a special great-granda of John and Steven. Reception and vigil at St Leo the Great R.C. Church, Beech Avenue, on Wednesday, 13th August, at 7pm. Funeral Mass on Thursday, 14th August, at 10am, thereafter to Craigton Crematorium, Berryknowes Road.GIULIANOTTI Suddenly, at A.R.I, on Tuesday, May 9, 2006, Eugenio (Jimmy), late of The Venice Cafe (Louis), aged 84 years, dearly beloved brother of Santino and the late Dino, loving brother-in-law of Ella, a dear uncle of Ian and Rosa and much loved great-uncle of Jacqueline, Scott and Ryan. Sadly missed. Family flowers only please. Funeral private at his own request. .GIULIANOTTI Peacefully at Moncreiffe Nursing Home, Bridge of Earn, on 2nd January 2010, Henry Severino Giulianotti, aged 82 years, beloved husband of Adele Maria Poretti, much loved father of Michele, Henry and Louise and a dearly loved brother of Lena and Gina. R.I.P. Remains to be received into St. John’s RC Church, Melville Street, Perth on Friday 8th January at 6pm. Funeral on Saturday 9th January, Requiem Mass in Church at 10.00am thereafter to Wellshill Cemetery cortege arriving Jeanfield Road gate at 10.50am to which all family and friends are respectfully invited, family flowers only please. Hi Sarah. It was really good to read your comment. I am the Great grand-daughter of Ernesto Giulianotti who started the shop in Stonehaven in 1899. When he and his wife Angela (nee Becci) returned to Italy to live (not sure of date but I think around early 20’s) with their 3 youngest children, the business carried on run by Angela’s brother Giuseppe Becci , known affectionately as Joe Bey, and his niece , Ernesto’s oldest child Carolina , known as Lena. We are not sure how the shortened name came about, but locals still talk about going to Joe Bey’s for the best Icecream. I never knew him as he died in the 1950’s, before I was born. By all accounts he was a jolly sort of guy , quite stout , but I haven’t ever heard a bad word about Joe. My Dad Freddie thought the world of his Great Uncle and we have a picture of Joe on display in the shop to this day. I am glad your father thought back affectionately of his early days and the people at E. Giulianotti’s, Stonehaven. Joe and Lena must have thought a great deal of your parents too. Unfortunately they have all passed away, my parents too, and there are few people around now to ask about these times. Best wishes to you, and feel free to get in touch. Marjory Stephen E Giulianotti, 12 Evan Street, Stonehaven 01569 762444.
my father is the son of adam peter giulianotti and maggie jane keith(mother). he also has a sister who lives in canada her name is nellie giulianotti. they are both still living,my father and i live in peterhead and his grandparents are peter giulianotti and elizabeta landini whom are buried in peterhead cemetry along with 3 other deceased children born to elizabeta.my fathers name is alberto giulianotti and he married agnes christie dow of aberdeen he is aged 78years and they have 5 children, stewart dow is the son of my mothers first marraige. I am teresa maria giulianotti aged 52 next is albert peter giulianotti aged 50 and last is twin brothers dennis and derek giulianotti both 49 years old. My father worked for his father in aberdeen at their ice cream factory called Holburn Ices and he was a managing director most of his adult life until it closed down in the eighties.His father Adamo Peter died in1965 and his wife maggie jane keith died on31st oct 1972 they both lived at 414 king street, aberdeen and I was born on the 2nd November 1960 in that house, but we lived at 105 Bon Accord Street, Aberdeen. My auntie Nellie married bert pratt and moved to canada about 1964 and was back in peterhead recently to visit us in peterhead in August of this year and she also has fond memories of 22 chapel street. After my great grandfather peter died my great grandmother came to live at 105 bon accord street in aberdeen and my father has a lot of fond memories because he often as a child stayed with his grandmother there, which was to become our family home later on but i think a lot of our family lived in this very large town house at one time or another. Elisabeta Landini also attended my auntie nelllies wedding and my father was a teenager at that time. I think my father could tell you a thousand and one stories about the giulianotti family and their origins, he and his sister also went to visit relatives still alive in borgotoro at the family homes over the last 20 years,as i hope to do some day, my daughter also has been. I now recently have had the first 2 grandchildren in my side of the family and i hope to pass on a lot of this information to them in their future as my father and his father did with us. 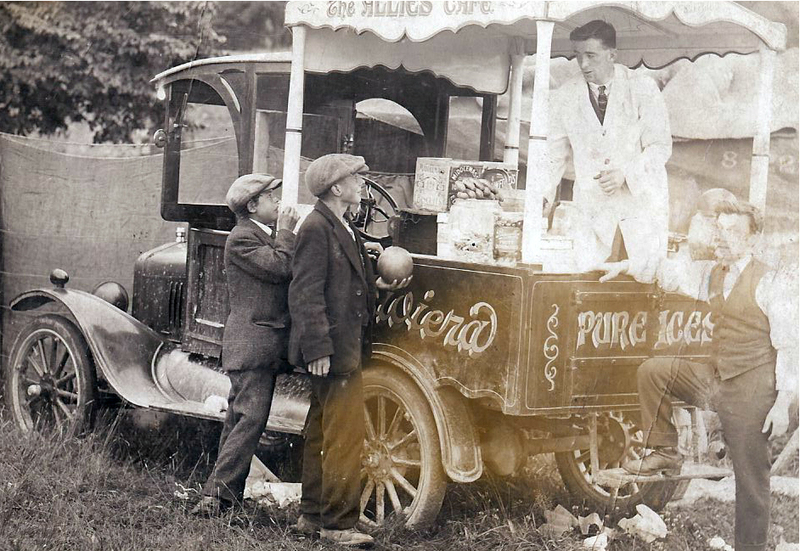 Ime sure their are still a lot of people remember my father from the ice-cream factory days , when the factory used to be in Jacks Brae in Rosemount, Aberdeen. The thing my father always remembers about his grandmother and grandfather was they were a hard working family that came from humble beginings and this strange country they came to in the begining wasnt always kind to them,but they made their home here and Ime so glad they did because the very town they came to in the begining has become home for me,my father and my daughter now, we have all ended up living here in Sunny Peterhead and we absolutely love it now. Hola Maria Teresa Giulianotti .MI abuela materna era Maria Domenica Giulianotti, hija de Antonio Giulianotti y Elizabeta Landini. Nació el 10 setiembre 1905. Mi abuela era viuda y el 8/01/1932 se casó por poder con Gughielmo Moscatellli en la Iglesia de Peterhead, y vivía en la calle Capilla 24, según un registro de la Iglesia Católica-Roma del Districto de Peterhead, en Aberdeen. Ella se vino a vivir a Uruguay en América del sur, y tubo 4 hijos: Julia; los mellizos Ernesto y Maria Elena; y Guillerno. Maria Elena es mi madre y tiene recuerdos de su tío Luigi y Attilio, y de cartas de sus primos Alberto y Nellie que le mostraba su madre.Yo era muy pequeño pero recuerdo a Attilio y su esposa Victoria que estuvieron por aca, y tenemos postales que mandaron ellos y de su hija Silvia que estaba casada con Danilo. 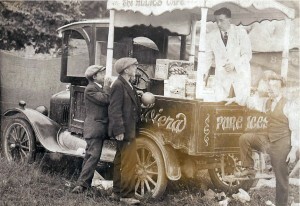 Recuerdo que Attilio hablaba de la Fabrica de Helados y de premios que habían ganado por sus helados, y que eran diferentes de los que se hacen aquí. Se que vino otro familiar antes de Attilio, pero no lo recuerdo yo era muy pequeño, le voy a preguntar a mi madre su nombre. Me gustaría que le preguntes a tu padre si recuerda de estos hechos que yo te narro y si lo deseas ponernos en contacto. Saludos para todos. intresting web site as it mentioned’s my late uncle peter giulanotti who live in scotland,my own parents are from valdena a small hamlet in borgo val d’ taro.my own family live in glasgow,and my son is at uni in edinburgh. My aunty linda died on the 16 november 2013, reception and vigil will be held on the 24 november 6pm at st leo the great r.c. church,funeral mass on 25th at 10am she was the last of a great generation that had to work very hard and fight prejudice during a time in history that many italians sufered just to make a living will be missed by lots of people who had known her,I SURELY WILL. I am just wondering if you are a relation to my Grandfather. MY grandafther was Giovanni Zaccarini. His mother Was Maria Zaccarini, m.s. Alzapiedi, she then married Luigi Fugaccia after her Husband luigi died. Will be very interesting if we could chat regarding this. 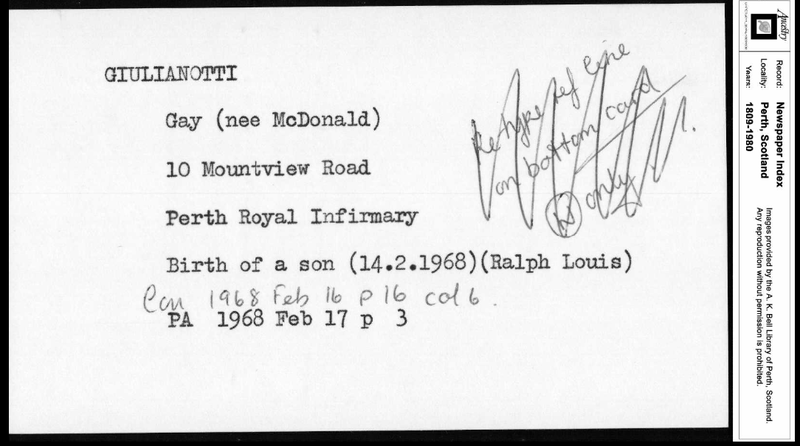 My name is Gay Giulianotti nee Macdonald.I am married to Ralph Giulianotti,b,16/3/42.We have three children, Ralph and Mark ,whose births have already been shown on the web page and a daughter Grace. The unknown Giulianotti photograph on the web page is of Severino Giuseppe Giulianotti and Assunta Corvi. My Grandfather’s name was Louigi Giulianaotti , he was born in Italy but his family moved to Scotland. He married Elizabeth MacDonald. He had a brother named Guildo ( not sure of the spelling ) and several sisters. Lou and my uncle moved to Canada and went by the last name Williamson, before my mother was born. They had 4 children Louie Rossi , Annette, Eileen Joyce, and Charles. Looking to find other relations to this part of my family. Thank you.